For me, there has always been something uniquely calming about a beautiful, expertly constructed piece of clothing. Most of the garments I put on my own body are admittedly boring, but my childlike enthusiasm for pretty things has never quite waned; when you look at the very best clothes, for a moment, everything else falls away. 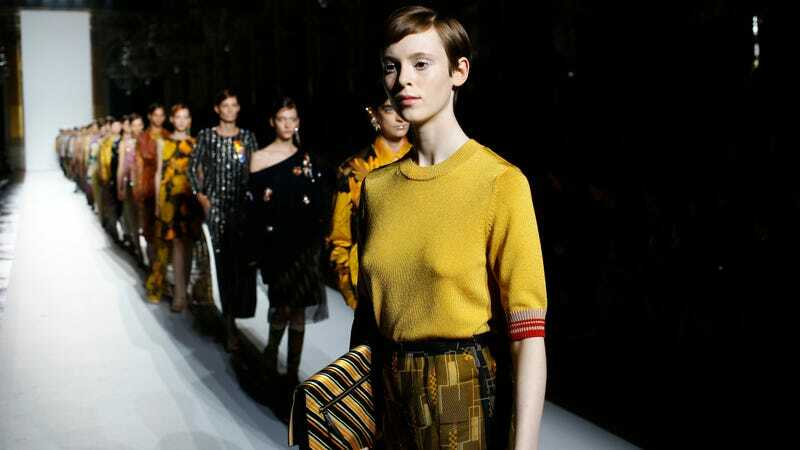 It wasn’t until I started flipping through Dries Van Noten’s Spring 2018 collection that I realized how much I needed it. The collection has the requisite mishmash of prints and perfect two-piece looks and brocade elements, but, as always, it’s a little bit new this time. Using sheer overlays, scarves and light, jangly diamond-esque embellishments and broaches, the mood is lighter, diaphanous. A delicate, nearly invisible metallic belt lightly hugs a blush silk patterned dress; a heavily-layered look, using sheer silk and shimmering brights, somehow presents as buoyant. Normally I’d raise an eyebrow at a quote like that, because I generally believe fashion designers should make an effort to be much more political; too many of them have contented themselves with meaningless gestures. But here, in the context of this collection, it feels appropriate: a reminder, in the midst of a parade of suffering and malicious incompetence, that we can generate beauty and wonder with equal skill.